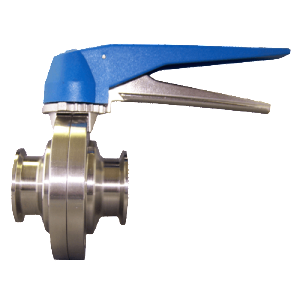 >These Are A Good Alternative To More Expensive Valves – Top Line Process Equipment Co.
Sanitary butterfly valves are a good alternative to more expensive valves for use with fluids that are not intended to be used on USDA dairy products. Due to the butterfly valves simple design, it’s easy to maintain with minimal parts involved during servicing. 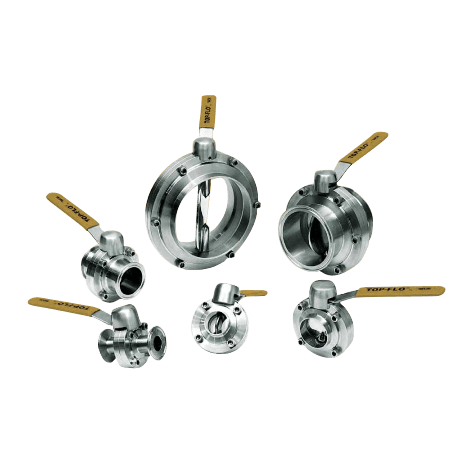 Sanitary butterfly valves are typically found in applications that have a low internal line pressure (less than 145 PSIG). 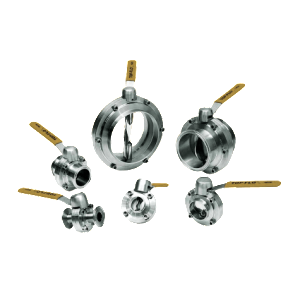 They can be utilized as either shut-off or throttling valves depending on the controls or top works applied to the valve itself. 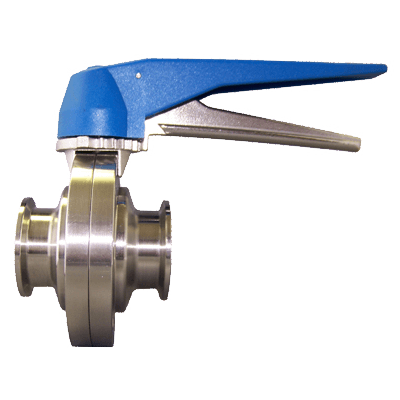 Top Line offers three different types of sanitary butterfly valves to better service industry-specific applications. 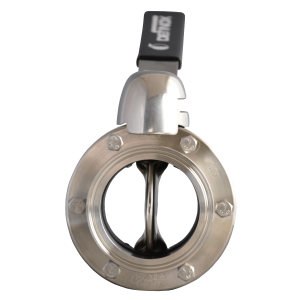 The value type butterfly valve is a low cost, 2-piece manual valve alternative, specifically for the micro or craft brewery industry and also for smaller wine production facilities. The multi-position thermoplastic/stainless steel trigger handle is well suited for both shut-off and manual throttling capability. The standard type butterfly valve is an option-oriented, mid-range priced, 2-piece valve that is well suited for most fluid process applications. The key to the standard type valve is its ability to be customized with a full range of both manual handle and automation options. The premium type butterfly valve is a heavy duty style valve that is available in both standard 2-piece and 3-piece “between flange” type. The 3-piece type allows for even greater ease during maintenance and is more forgiving with slight misalignment issues during installation. Multiple manual handle options allow the user to control the valve in several ways. The automated version comes standard with a heavy-duty canister style steel pneumatic actuator.